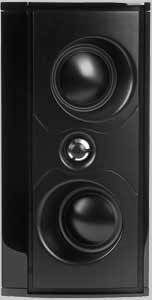 The Definitive Mythos XTR-60 is the step-up larger version of the original XTR speaker, the highly acclaimed XTR-50. Drive Units 1 Aluminum dome High-Frequency 1"
4 XTDD Anodized Aluminum Mid/Bass 3.5"
4 Aluminum Domed Bass Radiator 3.5"
The Definitive Mythos XTR-50 is the first high performance on-wall speaker whose depth matches that of today's ultra-thin TVs. It is a mere 1.5 inches deep when mounted on a wall, shallower than many ultra-thin TVs when they are wall-mounted with their factory sanctioned mounting hardware. Beyond its utility and clean modern styling the XTR-50 stands out due to its uncompromising sound quality equivalent to full-size speakers. Definitive's engineers have unleashed their awesome creativity and brain power to develop this revolutionary speaker that has the high definition detail and dynamic range performance of large speakers yet is a mere 1.5" deep. The secret to the XTR-50's extraordinary performance is Definitive's patent-pending XTDD technology anodized Aluminum dome driver. Using state-of-the-art computer modeling and decades of speaker design experience, Definitive engineers eliminated every iota of wasted space, optimized every part and maximized the moving surface area of a dynamic driver to shrink it down to an impossibly compact dimension without giving up ultra high performance audio fidelity! No other speaker complements your ultra-slim television with more style, versatility and sheer performance. 2 XTDD Anodized Aluminum Mid/Bass 3.5"
4 Aluminum Dome Bass Radiator 3.5"
The Mythos XTR-40 is the best on-wall model in the critically acclaimed Mythos line of high performance loudspeakers. The XTR-40 can be mounted directly to the wall using the key-hole slots on the back of the enclosure and well-anchored screws. If you choose, the speaker can be wall mounted using the supplied mounting bracket that allows either vertical or horizontal orientation with a total installed on-wall depth of only 40mm. Two adjustable support feet are supplied in cases where you place the XTR-40 on a shelf as a center channel speaker (horizontal orientation). The Mythos XTR-40 is ready to look terrific and sound astounding. 2 Aluminum Domed Bass Radiator 3.5"
The XTR-20BPs are yet another astonishing breakthrough for Definitive Technology. The XTR-20BP matches the distinctive XTR series look, a gorgeous hand-polished, aircraft grade Aluminum enclosure. Because they use the same active drivers and tweeter as the rest of the XTR series they're perfect for use as surround speakers in a system made up of larger XTR main speakers. Each Mythos XTR-20BP contains two 3-1/2 inch XTDD mid/bass drivers that are angled in opposite directions to broaden the midrange dispersion for the kind of diffuse soundfield sought after by home theater enthusiasts for surround loudspeakers. Use the XTR-20BPs for surround channel duties and you'll be rewarded with spacious and enveloping surround effects that will make you feel like you're in the cast of the movie. The XTR-20BP comes with an easy-to-use wall mount bracket and a convenienet support foot when you want to use it on shelf or table.